With simple steps, your home can be safer and you can manage your or your child’s allergy with confidence. 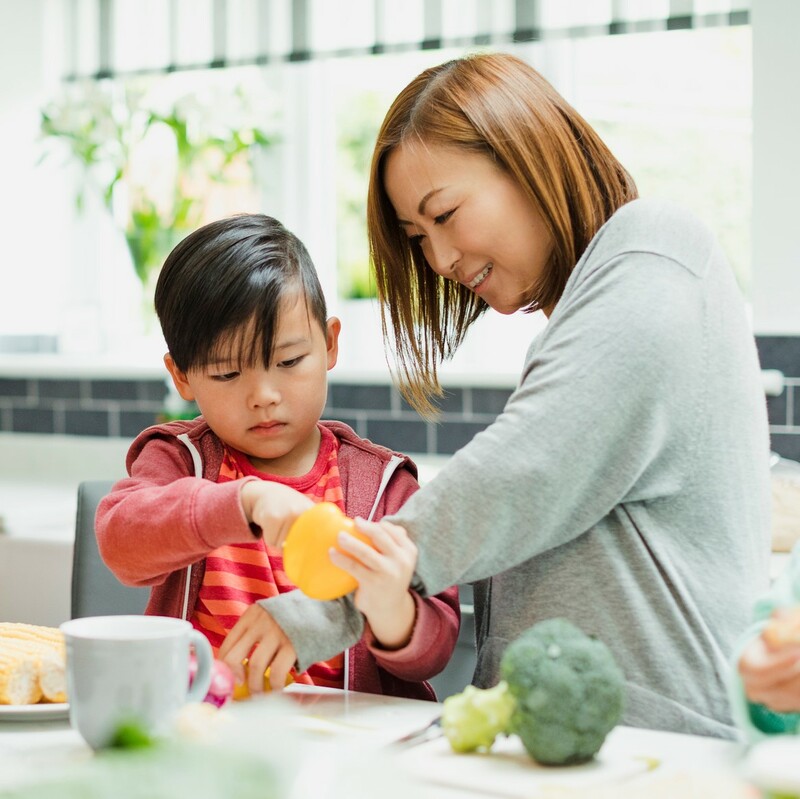 Home is the perfect place for you and your family to learn how to manage food allergy, because so much more is under your control. You decide which foods enter your home. You can set up household rules to prevent cross-contamination when storing, preparing and serving food. You have more time to read food labels and, for parents of children with food allergy, teach your child this skill in a relaxed setting. Your whole family can be involved in meal planning at home. They will gradually learn safe practices, such as replacing ingredients in favourite recipes to make them safe to eat. Always have an Anaphylaxis Emergency Plan and an auto-injector at home. Ideally you should keep at least two auto-injectors on hand, in case you need a second dose during an allergic reaction. If you make food in your home that contains a family member’s allergens, here are some great tips for staying safe. Cook meals that are free of the person’s allergens first, using separate cookware and serving utensils. Keep the food covered in a space where it will not be splashed or come into contact with other foods. Do not use the same utensils when cooking or serving food to the person who has the food allergy. Wash hands often, especially before and after preparing meals that contain an allergen, and the allergy-safe meal. Wipe down surfaces before preparing meals; and use a separate sponge on surfaces that contain the allergen. Have two dishwashing cloths: one for cleaning pots and pans that contain the allergen, one for cleaning pots and pans that are used for allergy-safe meals. Use two different cutting boards: one dedicated to allergy-safe meal preparation. Carefully wash all utensils (forks, spoons, servers), pots and pans and cutting boards with dish detergent and water. Learn easy ways to avoid cross-contamination in our avoiding cross-contamination section. Even at home it’s good to have a plan, so everyone is prepared if there is a reaction. 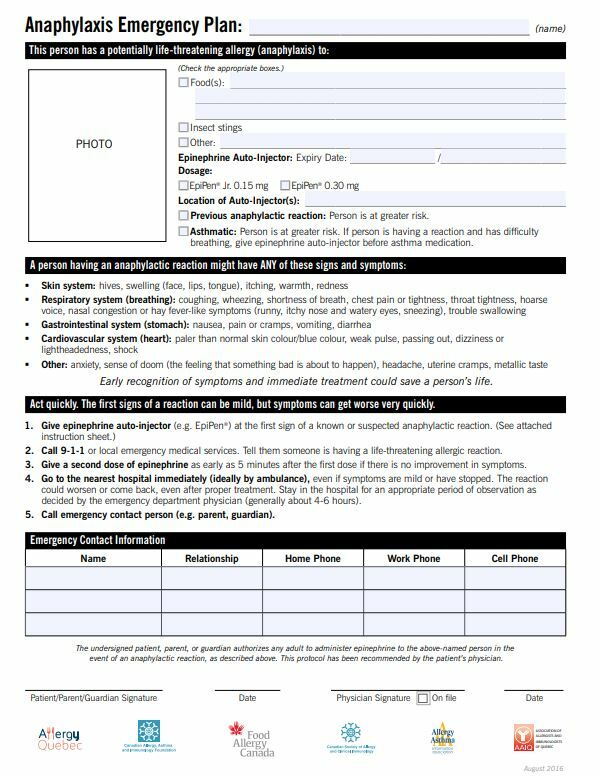 An Anaphylaxis Emergency Plan can be shared with extended family, housemates, babysitters or anyone else who comes into your home. All family members and caregivers should know how and when to use an epinephrine auto-injector. Have up-to-date auto-injectors and know where to find them. Keep your auto-injectors and any other medications recommended by your doctor handy. Make sure they are out of reach of young children and that family members know where they are kept. Review and understand what to do in an emergency. Post a copy of your emergency plan, including the phone number of your local emergency services. Take our free 30-minute online AllergyAware.ca course for the community. It’s perfect for family and friends. The kitchen refrigerator is a great place to post a copy of your emergency plan. You can get a free training device (which contains no needle or drug) to demonstrate how to use an auto-injector. It is important to practice the steps in an emergency plan so everyone knows what to do. Visit epipen.ca for an EpiPen training device. For more information about AUVI-Q® auto-injectors please click here.